The following is a review of McClelland's Super Balkan I did on 3/7/06. A lavishly flavorful Balkan blend using the finest dark frangrant, cool-smoking Syrian Latakia, and seasoned with top-grade Louisiana Perique. Rich and mellow. 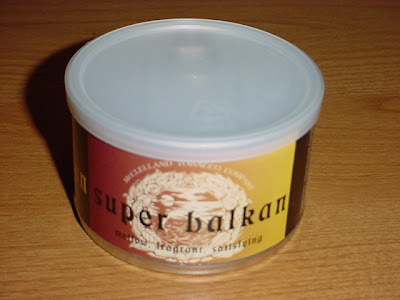 Syrian Super Balkan - Wow theres the expected Ketchup smell...how is that and why? Is McClelland casing their blends in Heinz? Anyway onto Super Balkan. Reviewer Pipeline summed this blend up best in their update. This is hard for me, as well, to identify as a good Balkan blend little alone a Balkan blend...shoot what does this taste like? I am dissapointed...I was expecting the Balkan to end all Balkans hence Super Balkan...uh...not this time. =( On to the next. Try Frog Morton On The Bayou or On The Town instead.